The opinions and evaluations stated here in are only the author’s and cannot be construed to reflect those of any Government agency, company, institute or association. It is based on public information, circumstantial evidence, informed speculation, and declassified U.S. intelligence community documents, official US government documents and histories, oral histories, interviews and engineering analysis. As with all data regarding the intelligence programs of the US intelligence community, this analysis is subject to revision--and represents a work in progress. The Smithsonian's National Air and Space Museum and the National Reconnaissance Office hosted a one-day-only viewing opportunity of the newly declassified HEXAGON (KH-9) satellite in the parking lot of the Steven F. Udvar-Hazy Center Saturday, Sept. 17. This was the first time the public was able to view this impressive spacecraft, and it wase the only opportunity to see it in the Washington area for some time. Sixty feet long and 10 feet in diameter, the HEXAGONs were the largest spy satellites the United States had ever placed in space. The satellites took photographs of the Soviet Union and other targets around the world from 1971 to the early 1980s. The one-day display is in conjunction with the NRO's 50th anniversary celebrationg. KH-9 was a big step forward for US space reconnaissance capabilities. The camera system consisted of two Perkin-Elmer "Twister" optical bar rotating mirror cameras with 60 inch diameter or focal length lenses, able to operate individually or together to produce stereoscopic images. The cameras could cover an area of 60 degrees to each side of of the spacecraft allowing 80 by 360 miles at a resolution of two to six feet. The KH-9 also included four nominal film capsules with some variants possible having five, and included some infrared film at the end of the reel, to provide experimental capability to see through cloud cover and expose camouflage. The ability of the KH-9 to photograph huge chunks of territory was a delight to the newly created Defense Mapping Agency (DMA). The fewer photos needed to cover a part of the world, the easier it was to construct an accurate map. The first KH-9 was placed in an elliptical orbit 114 by 186 miles, with a 96.41 degree inclination on June 15, 1971 . This orbit was sun-synchronous, so that each daylight pass was made at an identical sun angle, eliminating differences in shade angles on separate passes. Following missions had increasing lifetimes, and through the 1970's the US had nearly uninterrupted satellite reconnaissance capability, which greatly aided enforcement of arms control treaties with the Soviet Union and also provided crucial intelligence in the buildup to the 1973 Yom Kippur war. "The statistical summary of the KH-9/HEXAGON program showed 19 successful launches in 20 attempts. For those 19 successful launches, the KH-9 spacecraft operated with a mean inclination of 96.4 degrees, mean perigee of 101 miles, and a mean apogee of 159 miles. The mean lifetime of the 19 missions was 138 days. The actual lifetime grew significantly within the first three years of the program, going from lifetimes between 50 and 100 days to well over 100 days. Over the next ten years, the lifetimes of the KH-9 missions grew even further, moving from 158 up to 275 before the short 115-day final mission of 1984." (Richelson, J. America's Secret Eyes in Space . Harper and Row, 1990. page 211). It is however understood that in actuality it used a two camera system consisted of two high resolution folding image KH-7/KH-8 like stripped down rotating mirror optical bar Perkin-Elmer "Twister" camera's that rotated in partial twisting action around each other with 60 inch diameter or focal length lenses, able to operate individually or together to produce stereoscopic images. The cameras could cover an area of 60 degrees to each side of the spacecraft allowing 80 by 360 miles at a resolution of two to six feet. The camera system was used in high altitude low resolution mode to all fit within the 10 diameter and length of the spacecraft launch shroud design requirements. In all cases the spacecraft imaging systems were required to provide overlapping front and back images of the same area of interest for stereo views. When considering the 60 inch diameter lenses they obviously could not fit in the camera system side by side without notching the lenses. However if placed opposite ends near angled parallel to one another lengthwise telescope barrels side by side they individually gave forward and aft views and fit easily inside the spacecraft airframe and could be in part rotated about each others barrel for optimum operations.That is in addition to having to fit inside the launch shroud 10 feet in diameter and the skin of the spacecraft approaching 9.5 feet in diameter means that something had to move or the lenses were smaller than suggested in the final design installation. However if they were mounted one partially in front of the other as noted above with the ability to rotate partially about one another this makes sense for the two camera Optical Bar forward and rear looking imaging system. Those 60 inch lenses are in fact at opposite ends to one another allowing the forward and aft views to be accomplished as they are positioned giving enough room for the 60 inch diameter lenses with in the 9.5 feet diameter. This web site illustrates through its various schematics shows the variations reverse design studies which perhaps mimics to some degree the various design considerations from the known design data of the spacecraft. The last of the three designs of two stripped down side by side KH-8 optical bar camera’s is the most predominately displayed in KH-9 revealed designs as well as concepts of the subsequent KH-10, DORIAN – Manned Orbital Laboratory (MOL) payload design studies. 1. The KH-9 imaging capability had known limits of 30 degrees elevation from the target or 60 degrees off nadir angle which yields a 120 degrees swath potential imaging area capability. The KH-9 imaging system apparently used the same KH-7, 8 film used in the CORONA format. The wider frames provided for higher resolution Hexagon images. 4. Bus-1 Implementation Concept for Space Station Alpha, Lockheed Missile & Space Company, Inc., Nov. 25, 1993.,ppp1-4, 17-31, 64. 5. Day, Dwayne Allen, Sensitivity About Gambit And Hexagon Imagery Declassification, History of the Gambit and Hexagon Programs, The Recon Report September 20, 2000, FPSpace, Aug. 30, 2000. 8. 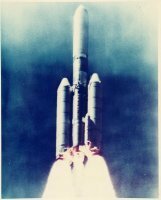 Day, Dwayne A., A Failed Phoenix: The KH-6 LANYARD Reconnaissance Satellite, Spaceflight, Vol. 39, May 1997, pp. 170-174. 9. KH-6 Camera System declassified NPIC document February 1963. 10. Day, Dwayne A, Pushing Iron Spaceflight, Vol. 46, July 2004, pp. 289-293.